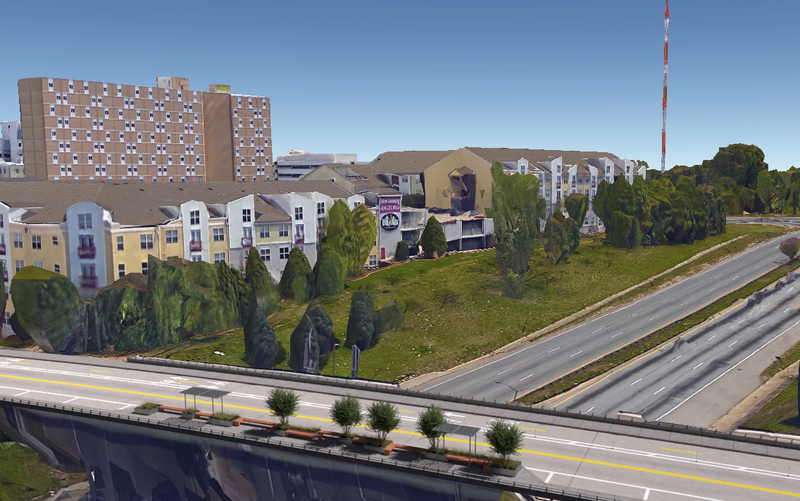 A rendering of the proposed park on the Jackson Street Bridge. The Walking Dead might have made the Jackson Street Bridge spanning Freedom Parkway famous, but it’s long been a beloved spot for locals, photographers, and tourists to take in one of Atlanta’s best views of the downtown skyline. Now the people who gather along its narrow sidewalk to snap photos of the cityscape will have a little extra room. 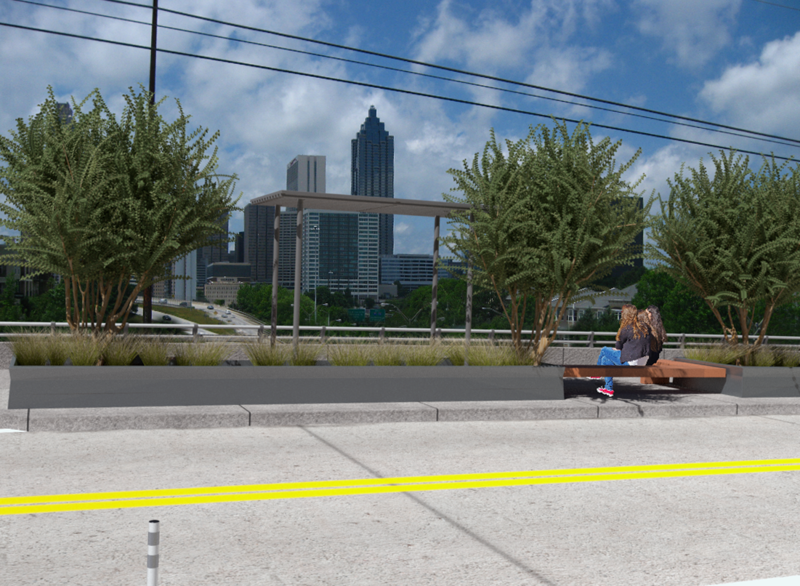 Atlanta’s Department of City Planning announced last week that a proposal turning part of the makeshift scenic viewing area into a mini-park would be built with the help of a new grant program to turn underused parts of neighborhoods into points of pride for the community. Submitted by Neighborhood Planning Unit M’s transportation committee, the proposal by Jonathan DiGioia, Katelyn DiGioia, and Ross Wallace calls for the creation of a small plaza with benches and landscaping and a road diet to allow more room for bicycles and car parking. 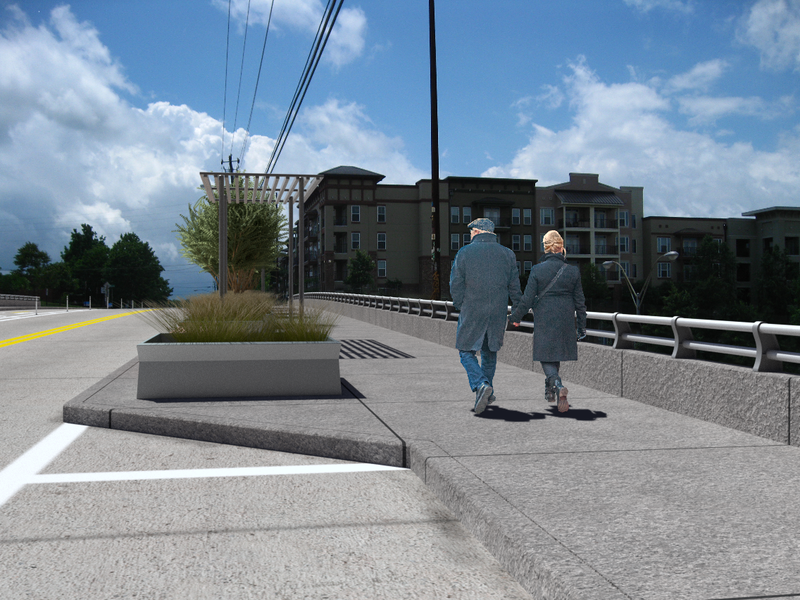 The road’s center turn lane will be removed to accommodate the widened sidewalk. 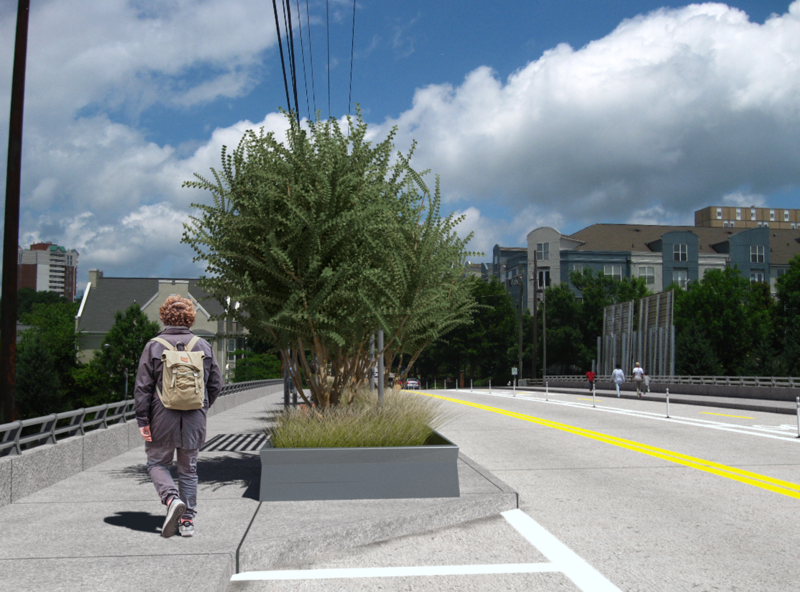 The concept, one of 30 submitted to the department and judged by city officials and groups like the Atlanta Regional Commission, would encourage visitors to come to what is already an Atlanta tourist destination and creates a safer space for them to congregate and shoot photos, as the group’s proposal noted, “adding pedestrian space could help prevent groups of people from spilling out into the roadway like they often do today.” NPU M, 4th & SAND, Fourth Ward West, Atlanta Celebrates Photography, Atlanta City Council District 2, and Central Atlanta Progress supported the application. 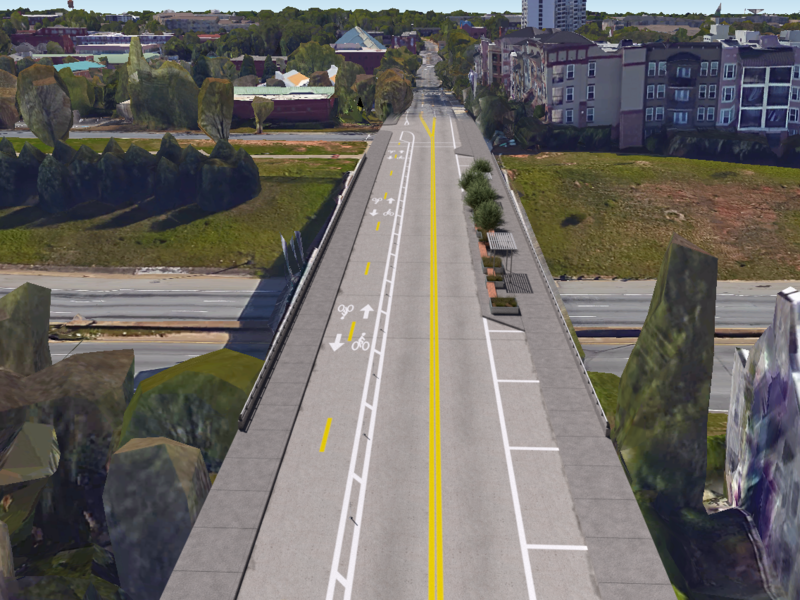 Another proposal to boost bicycle and pedestrian accessibility and add murals along White Street near the Atlanta Beltline’s Westside Trail (and Monday Night Garage) was also selected for the grant. 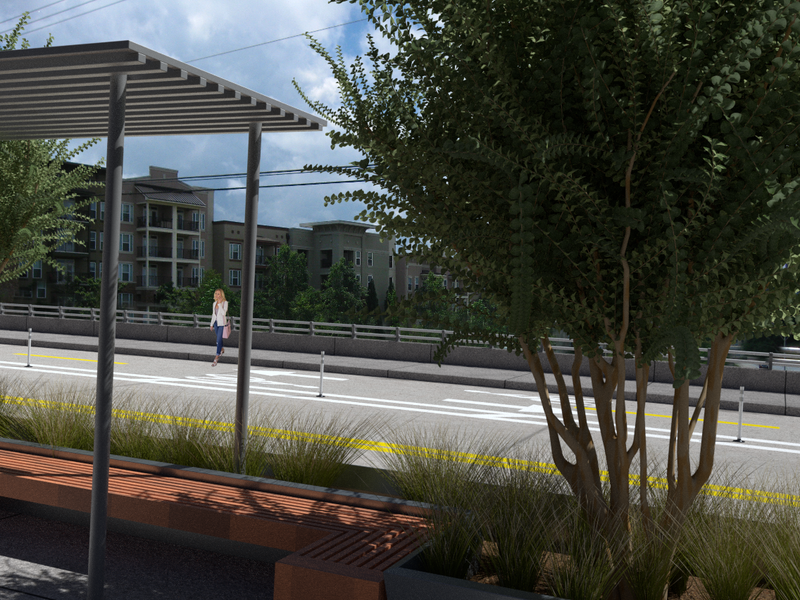 Note that the specific design and scope is subject to change based on community input, which the city plans to start gathering later this summer. In addition, the city does not say how much it is awarding the concept. “For me personally, this competition provided an opportunity to realize a concept discussed by many groups over previous years. As such an iconic gathering space within the City of Atlanta, it is important for the community to feel a sense of ownership of the space,” says Wallace. “Our team is excited to work with neighbors and citizens from across the city to refine the design of our concept and complete the construction of a safer, more enjoyable space for the community to utilize.